Please join us on Monday, October 5th for the PTO monthly family dinner night at Stevi B’s, 3335 N. Cobb Parkway, Acworth, GA (just before Home Depot), from 4:30pm – 9:00pm. It is all you can eat pizza, salad bar, and drinks. Adults are $8.99 and children are $5.81. 15% of each bill will be given back to the KCSMA PTO for future activities. Two tokens for the game room will be given to each child. Please let the cashier know which class your child is from as the classroom with the most participation will receive a free pizza party. Our September classroom winner was Miss Bailey’s Kindergarten class, and the PTO received a check for $102. Thanks to all that attended. We look forward to seeing you on Monday! October’s Teacher Appreciation Luncheon will be Soups, Stews, and Salads. You may sign up here to volunteer or donate luncheon items. Please consider volunteering during the luncheon. The teachers usually spend most of their lunch time helping their students open their milk, plastic ware, and lunch items, which leaves them with little time to eat. We would like to have enough volunteers helping the students, so the teachers can have a duty free lunch. They deserve it! ☆No visitors or volunteers in the building during the school day Tuesday through Thursday due to testing. ☆Box Tops are due October 1st. 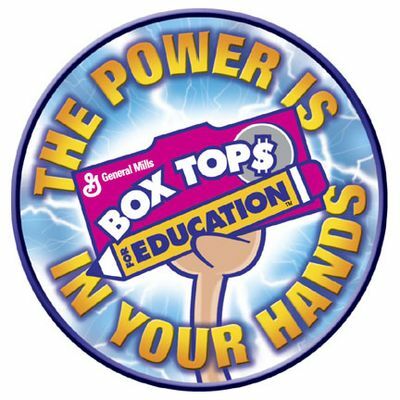 Please turn in all Box Tops, Labels for Education, and Tyson’s labels to your child’s teacher on or by October 1st. Remember, the teacher earns a $5 gift card for every 100 Box Tops turned in. ☆To sign up for the clean up and other volunteer opportunities, click here. If you subscribe to Box Tops for Education, we will earn five extra box tops. You will also be sent information about contests and extra earning opportunities. This only takes a minute, but if everyone does it, those box tops add up! Subscribe here. Thank you to everyone who sent in donations and food for the staff luncheon. Those of you who send in the food/donations do not get to hear the appreciation from the staff during the luncheon, so we wanted to let you know that THEY LOVED IT! Thanks to Pilar Kornegay for heading it up today and making it great. Lastly, thanks to all of the volunteers who helped today. Have a relaxing and safe fall break! Congratulations to Miss Bailey’s kindergarten class! Her class had the highest attendance at Stevi B’s last night for our family dinner night. Her class won a free pizza party. The PTO earned $102. Thank you to all the teachers, staff, and families who attended. We look forward to seeing you at the next one on November 5th! School board meetings are a great source of information for parents. If you have wondered who or how decisions are made or just want to be in the know, attend a meeting.